When you are away, a fire can destroy a lot before your neighbors notice the fire and call the fire department. A fire alarm can help alert the right individuals, though. If you leave pets alone in the house, time is of the essence if a fire starts. A loss due to a fire is often 10 to 20 times greater than that of burglary. If you are already having your Security System monitored, there is no additional charge for us to monitor smoke detectors. The majority of fire fatalities result from smoke inhalation. 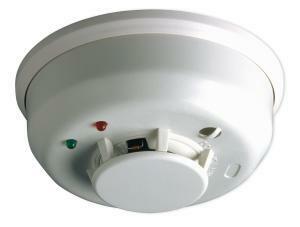 Properly installed and Monitored Smoke Detectors are your family’s first line of defense. They provide the earliest detection of a fire and can save lives. Your SHIELD Security Systems fire alarm solution can be equipped with monitored Smoke Detectors that will send a signal to our operators who will summon immediate help. We recommend this as a valuable addition to any security alarm system. After all, when it comes to fires, smoke alarms can make a huge difference. How can it impact safety? A monitored smoke detector is different from the smoke alarms that you buy at the hardware store or that the builder puts in the house when it is built. The way this fire alert system works is simple: The components are connected to the alarm panel, either with a wire or wirelessly and trigger it to call for help when smoke is detected. There are also situations in homes or businesses when Smoke Detectors might cause too many false alarms, due to excessive dust or smoke from cooking. If you want to protect your home or establishment from fire-related damage, there are other options available. In these cases, Heat Detectors are sometimes utilized. These devices often are triggered by rapid rises in temperature — think the outbreak of an indoor fire. When it comes to fire, do not take any chances. The integration of the right alarm systems can be a game changer — and often life saver — in these potentially life-threatening circumstances. Are you ready to purchase alarms that can protect your Kansas City or Overland Park business from fire? For details about out comprehensive fire alarm systems, call (913) 766-2248 — we look forward to serving you.